Through research, scientists have discovered the benefits of healing through sound therapy. The electromagnetic field around a person's body can be manipulated with different frequencies of sounds and vibrations. I believe the use of what are called binary beat to be one of the best ways to induce sound healing This is a process in which one ear hears one tone and the other ear hears a different tone creating a virtual third tone within the brain. When this happens, healing is able to occur. Each CD is made with a different set of tones to create different forms of healing and vibrational changes within the body. The best part is you will only hear a beautiful rainstorm and/or light music. You will not hear the tones and beats. 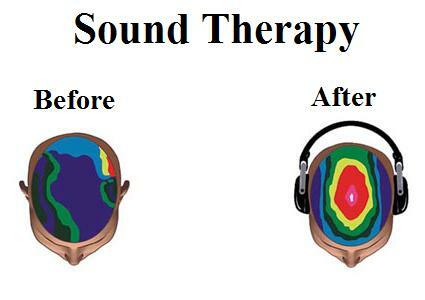 As you can see in the picture above, sound therapy helps to stimulate proper brainwaves and vibration levels. improve self confidence and many more.